A NEW LAW to allow owners affected by the underground section of the mass rapid transit (MRT) project to make a choice between parting with their properties and coexisting with the line running underneath is being drafted. However, he does not have more details about the new law, such as when it will be tabled in Parliament. “I don’t know. It’s with SPAD (Suruhanjaya Pengangkutan Awam Darat or Land Public Transport Commission) and the Land Office,” he says. According to him, under the new law, the government will pay a certain amount to the affected property owner as compensation for the inconvenience caused during the underground construction work and the hassle of having to incorporate future development plans of the property into that of the MRT line underneath, to avoid damaging the latter. This method of compensation is much cheaper than the government having to acquire the property outright. The concept of coexisting with the MRT emerged recently when Mass Rapid Transit Corp Sdn Bhd, the project manager of the MRT project, refuted the opposition’s claims that it needs to acquire land in Bandar Malaysia from its owner 1Malaysia Development Bhd (1MDB) to construct the underground section of the proposed MRT Line 2. MRT Corp said the new line can coexist with Bandar Malaysia, hence it is not necessary to acquire land from 1MDB. It also cited examples of such mutual agreements in the MRT Line 1 project, which involved some properties in Jalan Sultan and Jalan Inai in Kuala Lumpur. The new law is expected to expedite the MRT project by avoiding disputes over land acquisitions. 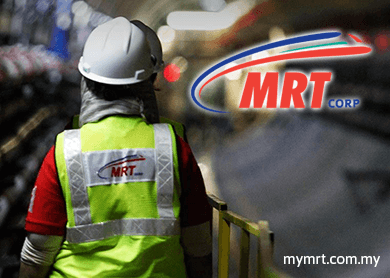 According to Azmi, land acquisitions for the MRT Line 1 were done very quickly, with some 90% of them concluded within 1½ years, thus ensuring that the line will be completed on time — by mid-2017. Nevertheless, there were some issues, notably with Selangor Properties Bhd, where its subsidiary Bungsar Hill Holdings Sdn Bhd (BHH) received notices of acquisition for its land from MRT Corp. However, the matter has been settled amicably with MRT Corp withdrawing the compulsory land acquisition notices. The land was required for a station and parking space. Meanwhile, about 20 owners in Jalan Sultan and Jalan Hang Jebat have signed agreements with MRT Corp, resolving issues and allowing a tunnel to be built beneath their properties. Under the agreements, MRT Corp will pay for structural strengthening works on the affected buildings.